There is that joke that the Queen thinks that everywhere outside of Buckingham palace smells of paint, because everyone redecorates before she arrives. Vodafone have released a ‘behind the scenes’ video of the Queen’s visit that show the huge amount of work that went on before her visit – even it appears, that the distance between each of the poles holding the red rope has to be measured. 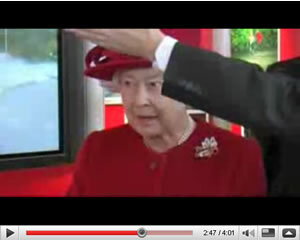 The second video is of the Queen’s visit, where you get to see everything finished and in place. I’ve never heard the joke about the Queen thinking everywhere smelling of paint before, made me chuckle – I can imagine she might!